I've been working on a first draft of a whole new set of Seeker's Quest verses! This set is tentatively titled "The Title of Liberty" and will cover the books of Alma, Helaman, 3rd Nephi, and maybe 4th Nephi as well. There are some fun new mechanics! One is called "Battle". When a battle is activated, your opponent puts verses from his/her deck into his/her discard. If that happens enough, you can cripple your opponents. Remember, unlike Magic, or Yu-Gi-Oh, having an empty deck doesn't lose you the game. However, with nothing to draw, you're out of resources, and it will be difficult to carry on! Another mechanic is the "Cross Reference". A cross reference verse will mention another verse. If you have that referenced verse in your hand when you trigger the Cross Reference effect, you can set it immediately. We're also exploring the markers, with some new ones, like Righteous and Unrighteous Characters, and Locations. The "Wartime" marker boost the Battle effect. Well, first I have to finish the first draft of the verses. I'm making them all on a big spreadsheet. Then, when I've got them done (I'm shooting for about 125 finished cards), then I'll flow the spreadsheet into a form and print out some prototype cards. These are the ugly ones, without graphics. Then, I'll tediously cut them apart and sleeve them. Then the real work begins! Playtesting! We'll test the set in isolation, meaning using randomized decks only of the new set. We may find some problems that we'll have to fix. Then, we'll mix the new verses in with the original Scripture Mastery set, and test that mix, using random decks. Finally, we'll make some decks and test those against each other, using both sets. If you're interested in playtesting, just let me know by emailing me at mrkhmusic@yahoo.com, and we'll get you in on the party! 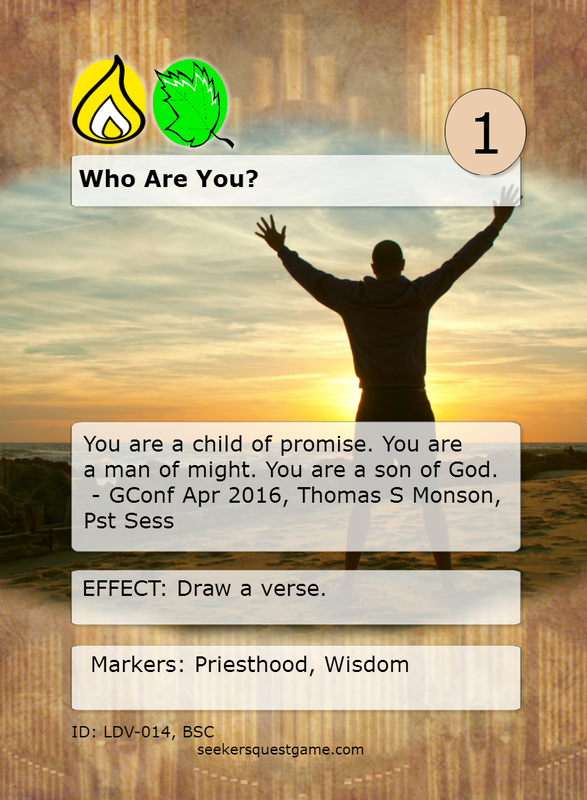 Card of the week: Who Are You? This verse is from our most recent Priesthood session. It’s quite an inspirational line. It’s good to remember where we came from and who we are. The inspiration is played out in drawing another verse.